Create an Excel file of the clients details. The columns titles should be the same as the names of the Hyper fields. Yet, this wizard allows to manually change and adjust the imported columns titles, to any required Hyper client card field name. The client card fields are displayed a the bottom of this page. Please note - the "Client Full Name" field contains the "Last name" and "First Name" fields, and therefore no value can be imported into this field. The copied columns titles can be removed by using the right click menu. Adjust the fields titles to Hyper's fields names. Press the Copy Column to Target Table (F5) button. Source Field - The imported field's titles (as written in the excel file). If this field title is identical to Hyper target field name, it will by displayed in red, while the identical Hyper field title will be automatically displayed in the "Copy Column to Target Table" field. If the source field does not have any identical Hyper field, it will be displayed in green, and the user should select the required target Hyper fields, from the list in the "Copy Column to Target Table" field. Copy Column to Target Table - Select the required target field of Hyper's clients table. Concatenate Strings (Use _ for Space) - If any concatenating string is required for this field's value, fill it in this field. This string will be added as the beginning of this field value. Press the Ok (F6) button to approve and continue. Please note - Any field title which was related to Hyper target field, will be displayed in black font at the top of the table. The rest of the fields titles will be displayed in green and wont be added to the client's card. After choosing all of the target fields, press the Continue button. 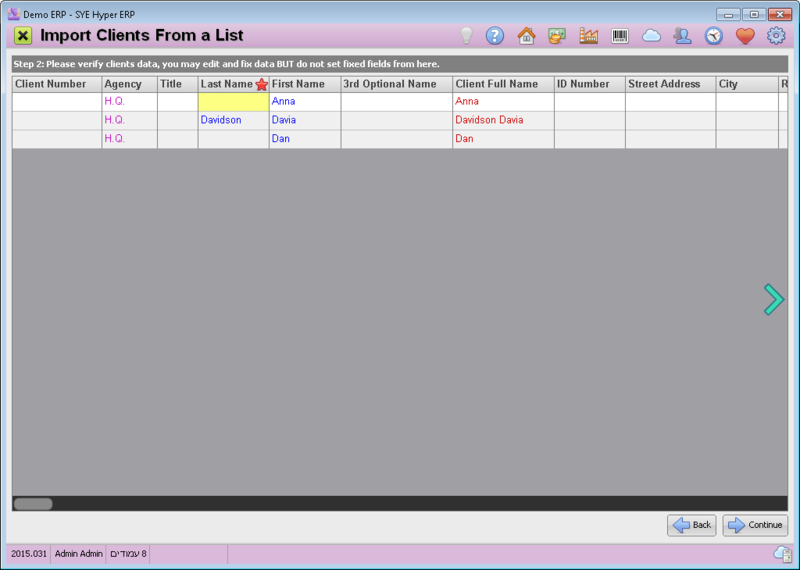 In the next table (Step 2), the system displays all of the new clients details. These fields values can be modified (and will be available and editable later, in the new clients card). Missing mandatory fields will be marked with a red star. After filling in the required fields, press the Continue button. Just Add New Leads - Add the new leads from the imported list. Add New Leads and Reset Exist - Add the new leads and update the exist clients cards with the imported clients details. If there is no First Name / Last Name, and no contact details (Phone Email), This lead will be added to the "Bad Client Leads" table, and will get the "Fictive Contact" status. If all of the required mandatory fields exist, the system executes a duplicated leads test, and checks the Client's name, Phone number and Email. If the system finds an exist client with the same details, it adds the lead to the "Ban Client Lead" table and gives it the "Duplicated Lead" status. Block Clients from List - This action changes the status of the clients as follows: If the client is a "Real Client", his status will be changed to "Problematic". If the client's status is "Follow up", it will be changed to "Client Not Interested". 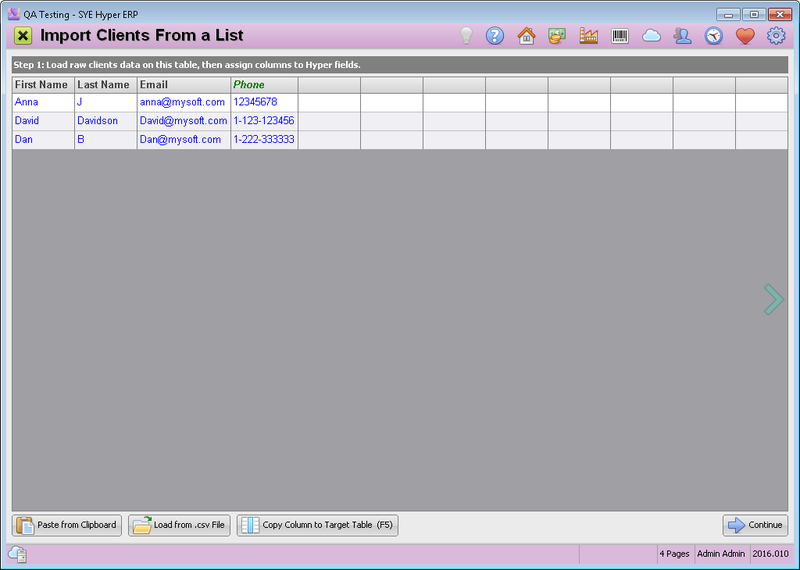 Delete Clients from List - Delete the list of imported leads, from Hyper's clients table. Use this option to delete an imported list of leads. Import the list again and choose this option. Delete Clients by Primary Key - Delete a list of exist clients, according to the Hyper's Client card number. 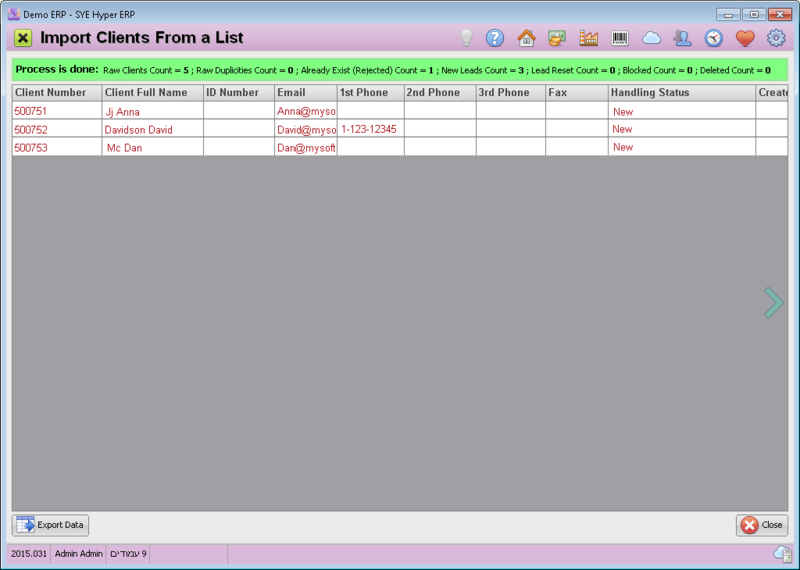 Include Contacts Table - Defines whether to also check each of the Clients "Additional Contacts". In this step, the system executes the duplicated clients check, before adding these leads to the the Clients table. Please note - the system does not validate the leads details, but only checks whether these details already exist. Delete phone (field data) shorter than 7 digits - delete the imported phone number if it has less than 7 digits. Use this option to validate the phone number length. If relationship abstract exist append it to relationship table - Add an exist relationship abstract to the relationship table of the client card. 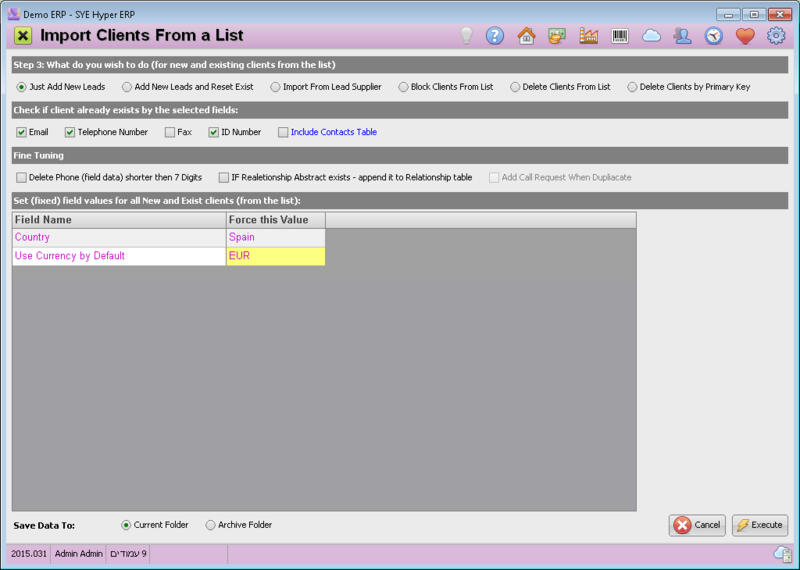 Add call Request When Duplicate - For duplicated lead, add a special note in the "Relationship" tab of the client card. Use this table to define a fixed and unified value for selected fields, for all of the imported leads. Select the required field name and fill in the required value (in the Force this Value" field). Select the required folder for the imported leads: Current Folder / Archive Folder. The system summarizes the process and displays it at the top of this table. Raw Clients Count - the number of imported records from the file (clients). Raw Duplicities Count - the number of records duplicities from the imported file. Already Exist (Rejected) Count - The number of imported clients that are already exist in the system, and therefore have been rejected. New Leads Count - The amount of imported new leads that have been accepted. Lead Reset Count - The amount of exist leads that have been reset (their exist details have been modified to the new leads details). Blocked Count - The amount of blocked leads. Deleted Count - The amount of deleted leads. Please note - an empty table will be displayed when all of the leads were imported successfully with all of the required details. All of the imported leads can be found in the Clients table (Current / Archive). The fictive / duplicated leads can be found in the Bad Clients Leads tab of the "Reports & Lists". Hyper also allows to import leads from Email messages and from landing pages. For further information, press here.